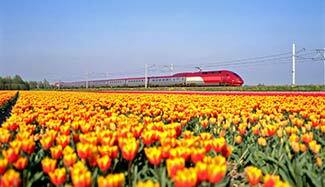 ABOVE: A Thalys train races past tulip fields in the Netherlands. INSET BELOW: A Thalys train and car attendant await passengers in Paris Gare du Nord. Thalys trains are operated by Thalys International, a cooperative venture of the French, Belgian, Dutch, and German national railways. The electric locomotives run on multiple voltages, making it possible for trains to cross borders without switching engines. In this article, we'll tell you how to buy tickets or use rail passes on Thalys and where to find both travel information and railfan resources on the Web. You'll also find a page of captioned photographs. Top photo copyright © Rail Europe. Inset photo copyright © Eurail Group.